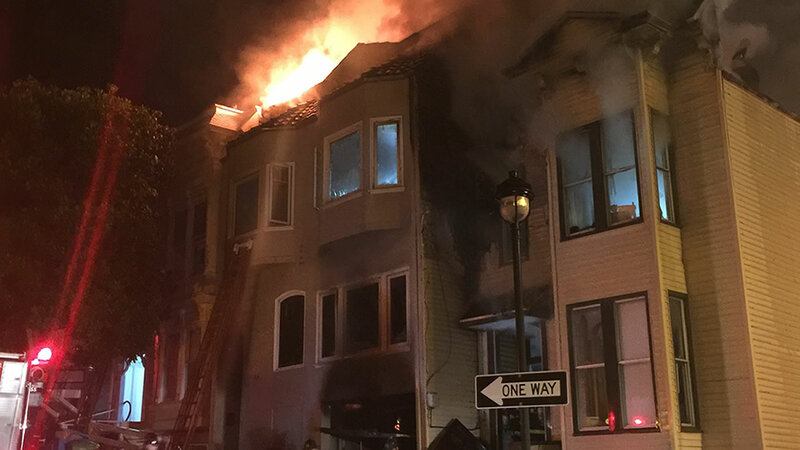 SAN FRANCISCO -- A San Francisco firefighter has been injured while fighting a four-alarm blaze in the Castro District, firefighters said at 1:10 a.m. The firefighter is being taken to the hospital with non-life-threatening injuries as crews continue to fight the fire, which was classified as a four-alarm just before 1 a.m. The blaze was reported at a two-story house at Market and Hattie streets. It was classified as a one-alarm working fire at 12:20 a.m. and upgraded to a second alarm five minutes later. Just before 12:40 a.m., the blaze went to a third alarm. Videos posted to the SF Firefighters 798 Twitter account show thick smoke and flames burning through the roof.